I’ve been a bit slow in the review area lately. I’m still reading, have no fear, but I am on vacation with limited internet access… and limited time! It’s lovely to unplug but I had to share a few words about this unlikely find. I finished the book I brought with me entirely too quickly and was on the lookout for something to amuse myself. I visited my aunt & uncle’s hardware store in the small town of Hidalgo. I saw a stack of books, gathering dust and possibly holding up the cables for the computer. 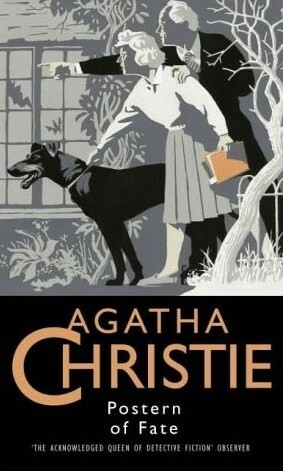 I asked if I could borrow the Agatha Christie title, one I had not heard. She gave me the whole stack. The book opens with a retired couple moving into a nice country home in need of a bit of TLC. Her nosey nature leads her to a room full of books, some of which have been made into a cipher. She translates it – Mary Jordan did not die a natural death. It was one of us. She is convinced it was written by the young owner of the book, Alexander Parkinson, whose family owned the house generations ago. 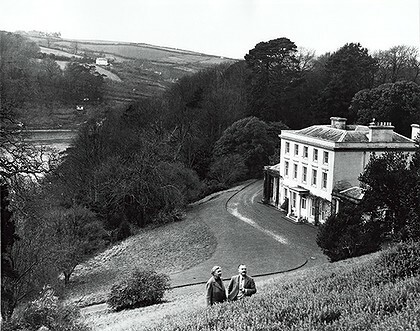 Greenway, Christie’s country home in Devon. What begins out of innocent curiosity, becomes an intrigue of increasing dangerousness. The list of clues grows as Tuppence and her husband Tommy try to casually gather information from neighbors. Yet when accidents seem to be more than accidents, and a beloved old gardener dies in a suspicious manner, the couple slowly begins to realize someone doesn’t want them to uncover the past of the house. It’s is a great little read. Most of it is told in dialogue, which Christie uses to extend the narrative, drawing out the tension. The main characters can be maddening because of their nattering on, but it’s of course effective. They are assisted by their Manchester terrier, Hannibal – rather like an older Nick and Nora with their Asta. And the settings often remind one of a Daphne du Maurier novel. Yet it smacks thoroughly of the dame of murder mysteries.